I've always loved vintage maps and have used them in the past as wall art, drawer liners, wrapping paper, and for other sundry projects. I'm visiting my folks in the Finger Lakes area of New York State and we always stop in the local Habitat for Humanity ReStore. If you have a ReStore in your area, it's a wonderful source of building materials and household goods for pretty reasonable prices. The inventory changes constantly based on what people donate so you never know what you'll find. Plus the proceeds go towards building houses for hardworking people who otherwise would never be able to own a home. 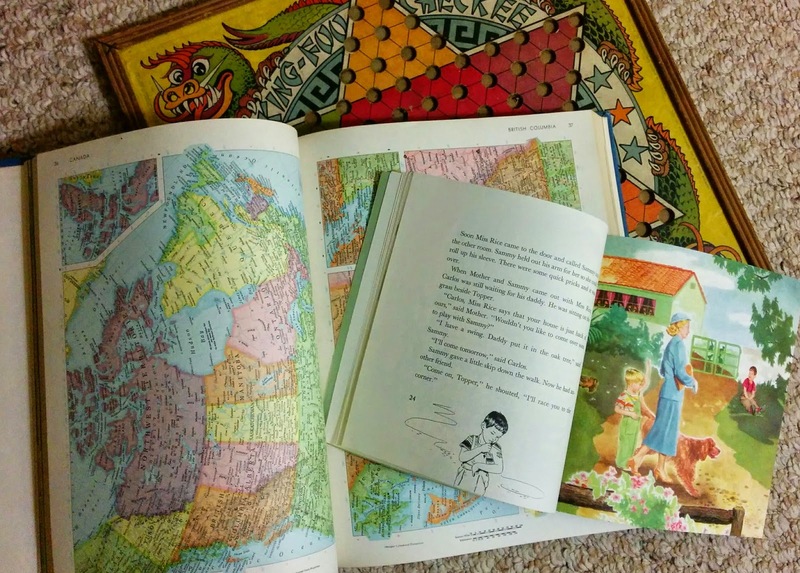 Today I found some fun vintage treasures, including the 1938 board game, world atlas, and children's book shown below. The checkerboard is headed for a living room wall. It's already framed so I can just add a loop of twine and hang it on a hook. It has a regular checkerboard on the back so we can take it down to play a game with my vintage wooden checkers. I'm not sure what I'll do with the picture book. I just loved the old graphics, especially of the women and dogs. I might use it to line my phone case (it has a clear back so I can insert whatever I want to change the look). 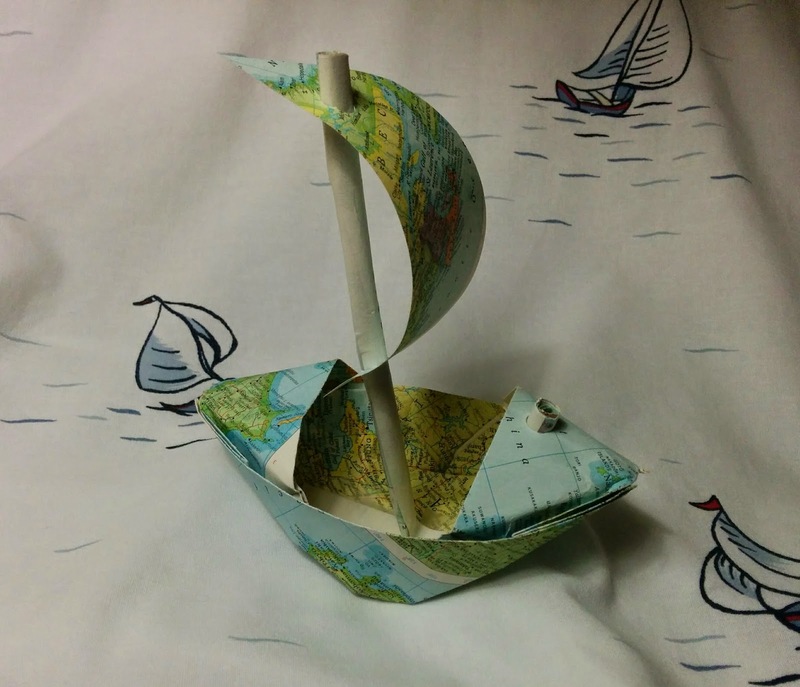 The maps will probably see many uses, but first I wanted to try an origami boat. I made lots of paper boats when I was a kid, mainly inspired by Curious George Rides a Bike. I wanted to make a different style than the old classic boat/hat design, so I gave this tutorial at Let Us DIY a shot. The folding went smoothly but I was stumped on step 8 for a while. You basically gently turn it inside out at that point as far as I can tell. I decided my boat needed details like a mast, so I rolled up a long tube and sealed it with tape, then added a sail (just a triangle of paper with holes punched in it). There are a plethora of map projects on Pinterest and the internet at large. My all time favorite is a "butterfly" collection. You can see it here.